Unusual sounds are indicative of a damaged head mechanism or a head crash. Although hard drive are robust, precise and durable designed storage device, it still faces equally the risk of malfunctioning and losing data. That may be caused by natural damage, human error or environmental disaster. Our data recovery schedule is not only at software rescue methodology, we even go through all media and components level whenever, wherever there is a possibility to rescue LOST DATA. Our laboratory was well equipped with both software tools and hardware instrumentation for diagnosting and repairing storage media devices. Initial fault accessment can be completed in rapid and accuracy way. Sometimes clean room dust free controlled environment is needed to be employed in case of opening defective hard drive for throughout inspection and repair inside the drive. No matter the data loss is the result of mechanical or electrical failure, virus attacks, system malfunction, human error, flood, fire or smoke damage, or just file corruption. 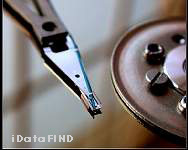 We have the best knowledge and effort to retrieve the LOST DATA rapidly and reliably. A well inventory of component parts is organised at ITPro iDataFIND in order to immediate response to the necessary of parts repairing and transplanting purposes.